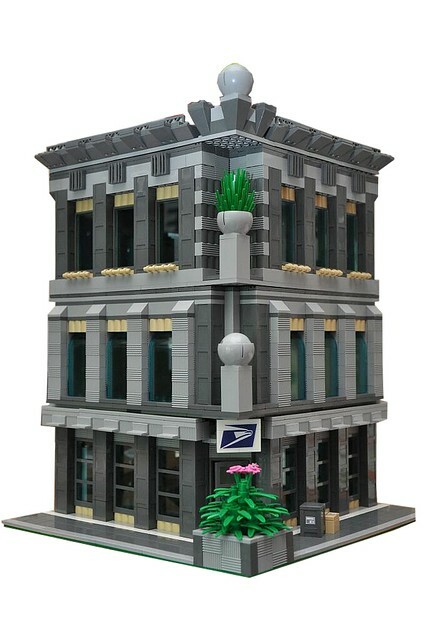 Brick Town Talk: Stamp of Approval - LEGO Town, Architecture, Building Tips, Inspiration Ideas, and more! Letter Lane - (BTT) Black Friday sales were down while Cyber Monday sales were up. It seems like anything brick-and-mortar is slowly going the way of the dinosaur, and certainly this website isn't about to advocate spending less time online. Despite the seeming doom and gloom, there is one physical establishment that couldn't be happier about the news - the post office. After all, those packages aren't going to walk themselves to your front door unless they are first in the hands of a postal carrier. As grey as the skies during those days with rain, snow, and gloom, this building stands strong in an uncertain world (until Google and Amazon perfect strapping boxes to drones).